The winners of the 2019 British Academy Film Awards have been announced. The awards, which honour the best British and international talent and contributions, took place at the Royal Albert Hall in London on Sunday, February 10th. 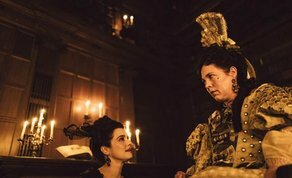 Yorgos Lanthimos’ ‘The Favourite’ was the big winner on the night, earning 7 awards from the 12 nominations it had received including Best Screenplay and Best British Film. Olivia Colman received the award for Best Actress, while Best Supporting Actress went to Rachel Weisz. The film also picked up Best Costume Design for Sandy Powell, Best Make-Up & Hair for Nadia Stacey, Best Production Design for Alice Felton and Fiona Crombie and Best Screenplay for Tony McNamara and Deborah Davis. Irish cinematographer Robbie Ryan missed out on a first BAFTA Award to Alfonso Cuaron who also pitted ‘The Favourite’s Yorgos Lanthimos to the Best Director Award for his Netflix-made semi-autobiographical drama ‘Roma’. Cuaron’s drama also picked up the award for Best Film and Best Film Not in the English Language, which saw the director, set a new record with four personal BAFTA awards for a single film from six nominations. Irish actors Barry Keoghan (‘Americal Animals’, ‘The Killing of a Sacred Deer’) and Jessie Buckley (‘Beast’, ‘Wild Rose’) were mominated for the EE Rising Star Award , which was awarded to ‘Black Panther’ star Letitia Wright. The Marvel film also picked up the award for Best VFX. Irish documentarian Chris Kelly was another to feature on the night having been nominated for a BAFTA in the category of ‘Best Debut by a British Writer, Director or Producer’ for his work on the IFTA nominated documentary ‘A Cambodian Spring’. Director Michael Pearce’s ‘Beast’ starring Jessie Buckley picked up the award on the night. Chris is credited as writer, producer and director on the project that won the Special Jury Prize for International Feature Documentary at the prestigious Hot Docs festival in Toronto in 2018.